Pope Pius XII (Italian: Pio XII), born Eugenio Maria Giuseppe Giovanni Pacelli[lower-alpha 1] (Italian pronunciation: [euˈdʒɛːnjo maˈriːa dʒuˈzɛppe dʒoˈvanni paˈtʃɛlli]; 2 March 1876 – 9 October 1958), reigned as Pope from 2 March 1939 to his death in 1958. Before his election to the papacy, Pacelli served as secretary of the Department of Extraordinary Ecclesiastical Affairs, papal nuncio to Germany (1917–1929), and Cardinal Secretary of State, in which capacity he worked to conclude treaties with European and Latin American nations, most notably the Reichskonkordat with Nazi Germany, with which most historians believe the Vatican sought to protect the Church in Germany while Adolf Hitler sought the destruction of "political Catholicism". A pre-war critic of Nazism, Pius XII lobbied world leaders to avoid war and, as Pope at the outbreak of war, issued Summi Pontificatus, expressing dismay at the invasion of Poland, reiterating Church teaching against racial persecution and calling for love, compassion and charity to prevail over war. While the Vatican was officially neutral during the war, Pius XII maintained links to the German Resistance, used diplomacy to aid the victims of the war and lobby for peace and spoke out against race-based murders and other atrocities. The Reichskonkordat of 1933 and Pius's leadership of the Catholic Church during World War II remain the subject of controversy—including allegations of public silence and inaction about the fate of the Jews. After the war Pius XII advocated peace and reconciliation, including lenient policies towards Axis and Axis-satellite nations. The Church experienced severe persecution and mass deportations of Catholic clergy in the Eastern Bloc. Pius XII was a staunch opponent of Communism and of the Italian Communist Party. Pius XII explicitly invoked ex cathedra papal infallibility with the dogma of the Assumption of Mary in his 1950 Apostolic constitution Munificentissimus Deus. His magisterium includes almost 1,000 addresses and radio broadcasts. His forty-one encyclicals include Mystici corporis, the Church as the Body of Christ; Mediator Dei on liturgy reform; and Humani generis on the Church's positions on theology and evolution. He eliminated the Italian majority in the College of Cardinals in 1946. In 1954, Pius XII began to suffer from ill health, which would continue until his death in 1958. The embalming of his body was mishandled, with effects that were evident during the funeral. 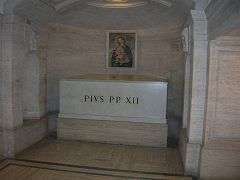 He was buried in the Vatican grottos and was succeeded by Pope John XXIII. In the process toward sainthood, his cause for canonization was opened on 18 November 1965 by Pope Paul VI during the final session of the Second Vatican Council. He was made a Servant of God by Pope John Paul II in 1990 and Pope Benedict XVI declared Pius XII Venerable on 19 December 2009. 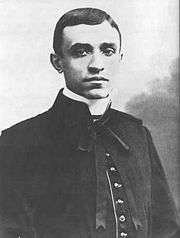 Pacelli on the day of his ordination: 2 April 1899. While all other candidates from the Rome diocese were ordained in the Basilica of St. John Lateran, Pacelli was ordained a priest on Easter Sunday, 2 April 1899 alone in the private chapel of a family friend the Vice-Regent of Rome, Mgr Paolo Cassetta. Shortly after ordination he began postgraduate studies in canon law at Sant'Apollinaire. He received his first assignment as a curate at Chiesa Nuova. In 1901 he entered the Congregation for Extraordinary Ecclesiastical Affairs, a sub-office of the Vatican Secretariat of State. Monsignor Pietro Gasparri, the recently appointed undersecretary at the Department of Extraordinary Affairs, had underscored his proposal to Pacelli to work in the 'Vatican's equivalent of the Foreign office' by highlighting the 'necessity of defending the Church from the onslaughts of secularism and liberalism throughout Europe.' Pacelli became an apprendista, an apprentice, in Gasparri's department. In January 1901 he was also chosen, by Pope Leo XIII himself, according to an official account, to deliver condolences on behalf of the Vatican to King Edward VII of the UK after the death of Queen Victoria. By 1904 Pacelli received his doctorate. The theme of his thesis was the nature of concordats and the function of canon law when a concordat falls into abeyance. Promoted to the position of minutante, he prepared digests of reports that had been sent to the Secretariat from all over the world and in the same year became a papal chamberlain. In 1905 he received the title domestic prelate. From 1904 until 1916, he assisted Cardinal Pietro Gasparri in his codification of canon law with the Department of Extraordinary Ecclesiastical Affairs. According to John Cornwell, "the text, together with the Anti-Modernist Oath, became the means by which the Holy See was to establish and sustain the new, unequal, and unprecedented power relationship that had arisen between the papacy and the Church." Pope Benedict XV appointed Pacelli as nuncio to Bavaria on 23 April 1917, consecrating him as titular Bishop of Sardis and immediately elevating him to archbishop in the Sistine Chapel on 13 May 1917. After his consecration, Eugenio Pacelli left for Bavaria. As there was no nuncio to Prussia or Germany at the time, Pacelli was, for all practical purposes, the nuncio to all of the German Empire. Once in Munich, he conveyed the papal initiative to end the war to German authorities. He met with King Ludwig III on 29 May, and later with Kaiser Wilhelm II and Chancellor Bethmann-Hollweg, who replied positively to the Papal initiative. However, Bethmann-Hollweg was forced to resign and the German High Command, hoping for a military victory, delayed the German reply until 20 September. Sister Pascalina later recalled that the Nuncio was heartbroken that the Kaiser turned "deaf ear to all his proposals". She later wrote, "Thinking back today on that time, when we Germans still all believed that our weapons would be victorious and the Nuncio was deeply sorry that the chance had been missed to save what there was to save, it occurs to me over and over again how clearly he foresaw what was to come. Once as he traced the course of the Rhine with his finger on a map, he said sadly, 'No doubt this will be lost as well.' I did not want to believe it, but here, too, he was to be proved right." For the remainder of the Great War, Pacelli concentrated on Benedict's humanitarian efforts especially among Allied POWs in German custody. In the upheaval following the Armistice, a disconcerted Pacelli sought Benedict XV's permission to leave Munich, where Kurt Eisner had formed the Bavarian Soviet Republic, and he left for a while to Rorschach, and a tranquil Swiss sanatorium run by nuns. Monsignor Schioppa, the uditore, was left in Munich. When he returned to Munich, following Eisner's assassination by an anti-Semitic extreme nationalist, Count Anton von Arco auf Valley, he informed Gasparri-using Schioppa's eye-witness testimony of the chaotic scene at the former royal palace as the trio of Max Levien, Eugen Levine, and Towia Axelrod sought power: "the scene was indescribable [-] the confusion totally chaotic [-] in the midst of all this, a gang of young women, of dubious appearance, Jews like the rest of them hanging around [-] the boss of this female rabble was Levien's mistress, a young Russian woman, a Jew and a divorcée [-] and it was to her that the nunciature was obliged to pay homage in order to proceed [-] Levien is a young man, also Russian and a Jew. Pale, dirty, with drugged eyes, vulgar, repulsive ..." John Cornwell alleges that a worrying impression of anti-Semitism is discernible in the 'catalogue of epithets describing their physical and moral repulsiveness' and Pacelli's "constant harping on the Jewishness of this party of power usurpers" chimed with the "growing and widespread belief among Germans that the Jews were the instigators of the Bolshevik revolution, their principal aim being the destruction of Christian civilization". Also according to Cornwell, Pacelli informed Gasparri that "the capital of Bavaria, is suffering under a harsh Jewish-Russian revolutionary tyranny"
After the Munich Soviet Republic defeated and toppled by Freikorps and Reichswehr troops, the Nuncio focused on, according to Lehnert, "alleviating the distress of the postwar period, consoling, supporting all in word and deed." Pacelli was appointed Apostolic Nuncio to Germany on 23 June 1920, and—after the completion of a Bavarian concordat—his nunciature was moved to Berlin in August 1925. Many of Pacelli's Munich staff stayed with him for the rest of his life, including his advisor Robert Leiber and Sister Pascalina Lehnert — housekeeper, cook friend, and adviser for 41 years. In Berlin, Pacelli was Dean of the Diplomatic Corps and active in diplomatic and many social activities. He was aided by the German priest Ludwig Kaas, who was known for his expertise in Church-state relations and was a full-time politician, politically active in the Catholic Centre Party, a party he led following Wilhelm Marx's resignation in October 1928. While in Germany, he travelled to all regions, attended Katholikentag (national gatherings of the faithful), and delivered some 50 sermons and speeches to the German people. In Berlin he lived in the Tiergarten quarter and threw parties for the official and diplomatic elite. Paul von Hindenburg, Gustav Stresemann, and other members of the Cabinet were regular guests. Despite Vatican pessimism and a lack of visible progress, Pacelli continued the secret negotiations, until Pius XI ordered them to be discontinued in 1927. Pacelli supported German diplomatic activity aimed at rejection of punitive measures from victorious former enemies. He blocked French attempts for an ecclesiastical separation of the Saar region, supported the appointment of a papal administrator for Danzig and aided the reintegration of priests expelled from Poland. A Prussian Concordat was signed on 14 June 1929. Following the Wall Street Crash of 1929, the beginnings of a world economic slump appeared, and the days of the Weimar Republic were numbered. Pacelli was summoned back to Rome at this time—the call coming by telegram when he was resting at his favourite retreat, the Rorschach convent sanatorium. He left Berlin on 10 December 1929. David Dalin wrote "of the forty-four speeches Pacelli gave in Germany as papal nuncio between 1917 and 1929, forty denounced some aspect of the emerging Nazi ideology." In 1935 he wrote a letter to the bishop of Cologne describing the Nazis as "false prophets with the pride of Lucifer." and as "bearers of a new faith and a new Evangile" who were attempting to create "a mendacious antimony between faithfulness to the Church and the Fatherland". Two years later at Notre Dame in Paris he named Germany as "that noble and powerful nation whom bad shepherds would lead astray into an ideology of race." Secretary of State Pacelli in Brazil in 1934. As Cardinal Secretary of State, Pacelli signed concordats with a number of countries and states. Immediately on becoming Cardinal Secretary of State, Pacelli and Ludwig Kaas took up negotiations on a Baden Concordat which continued until the spring and summer of 1932. Papal fiat appointed a supporter of Pacelli and his concordat policy, Conrad Gröber, the new Archbishop of Freiburg, and the treaty was signed in August 1932. Others followed: Austria (1933), Germany (1933), Yugoslavia (1935) and Portugal (1940). The Lateran treaties with Italy (1929) were concluded before Pacelli became Secretary of State. Roman Catholicism had become the sole recognized religion; the powerful democratic Catholic Popular Party, in many ways similar to the Centre Party in Germany, had been disbanded, and in place of political Catholicism the Holy See encouraged Catholic Action, 'an anaemic form of clerically dominated religious rally-rousing.' It was permitted only so long as it developed "its activity outside every political party and in direct dependence upon the Church hierarchy for the dissemination and implementation of Catholic principles.' Such concordats allowed the Catholic Church to organize youth groups, make ecclesiastical appointments, run schools, hospitals, and charities, or even conduct religious services. They also ensured that canon law would be recognized within some spheres (e.g., church decrees of nullity in the area of marriage). As the decade began Pacelli wanted the Centre Party in Germany to turn away from the socialists. In the summer of 1931 he clashed with Catholic chancellor Heinrich Bruning, who frankly told Pacelli he believed that he "misunderstood the political situation in Germany and the real character of the Nazis." Following Bruning's resignation in May 1932 Pacelli, like the new Catholic chancellor Franz von Papen, wondered if the Centre Party should look to the Right for a coalition, "that would correspond to their principles'. He made many diplomatic visits throughout Europe and the Americas, including an extensive visit to the United States in 1936 where he met President Franklin D. Roosevelt, who appointed a personal envoy—who did not require Senate confirmation—to the Holy See in December 1939, re-establishing a diplomatic tradition that had been broken since 1870 when the pope lost temporal power. A smiling Pacelli with Argentinian president Agustín P. Justo. 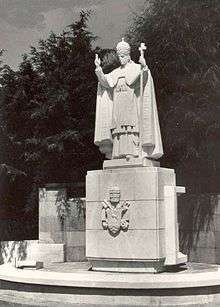 Pacelli presided as Papal Legate over the International Eucharistic Congress in Buenos Aires, Argentina from 10–14 October 1934, and in Budapest from 25–30 May 1938. At this time, anti-semitic laws were in the process of being formulated in Hungary. Pacelli made reference to the Jews "whose lips curse [Christ] and whose hearts reject him even today". This traditional adversarial relationship with Judaism would be reversed in Nostra aetate issued during the Second Vatican Council. According to Joseph Bottum, Pacelli in 1937 "warned A. W. Klieforth, the American consul to Berlin, that Hitler was "an untrustworthy scoundrel and fundamentally wicked person"; Klieforth wrote that Pacelli "did not believe Hitler capable of moderation, and ... fully supported the German bishops in their anti-Nazi stand." A report written by Pacelli the following year for Roosevelt and filed with Ambassador Joseph Kennedy declared that the Church regarded compromise with the Third Reich as "out of the question". Historian Walter Bussmann argued that Pacelli, as Cardinal Secretary of State, dissuaded Pope Pius XI — who was nearing death at the time — from condemning the Kristallnacht in November 1938, when he was informed of it by the papal nuncio in Berlin. Likewise the draft encyclical Humani generis unitas ("On the Unity of the Human Race"), which was ready in September 1938 but, according to those responsible for an edition of the document and other sources, it was not forwarded to the Holy See by the Jesuit General Wlodimir Ledochowski. The draft encyclical contained an open and clear condemnation of colonialism, racial persecution and antisemitism. Historians Passelecq and Suchecky have argued that Pacelli learned about its existence only after the death of Pius XI and did not promulgate it as Pope. He did use parts of it in his inaugural encyclical Summi Pontificatus, which he titled "On the Unity of Human Society." His various positions on Church and policy issues during his tenure as Cardinal Secretary of State were made public by the Holy See in 1939. Most noteworthy among the 50 speeches is his review of Church-State issues in Budapest in 1938. Between 1933 and 1939, Pacelli issued 55 protests of violations of the Reichskonkordat. Most notably, early in 1937, Pacelli asked several German cardinals, including Cardinal Michael von Faulhaber to help him write a protest of Nazi violations of the Reichskonkordat; this was to become Pius XI's 1937 encyclical, Mit brennender Sorge. The encyclical was written in German and not the usual Latin of official Roman Catholic Church documents. Secretly distributed by an army of motorcyclists and read from every German Catholic Church pulpit on Palm Sunday, it condemned the paganism of the National Socialism ideology. Pius XI credited its creation and writing to Pacelli. It was the first official denunciation of Nazism made by any major organization and resulted in persecution of the Church by the infuriated Nazis who closed all the participating presses and "took numerous vindictive measures against the Church, including staging a long series of immorality trials of the Catholic clergy." On 10 June 1941, the pope commented on the problems of the Reichskonkordat in a letter to the Bishop of Passau, in Bavaria: "The history of the Reichskonkordat shows, that the other side lacked the most basic prerequisites to accept minimal freedoms and rights of the Church, without which the Church simply cannot live and operate, formal agreements notwithstanding". 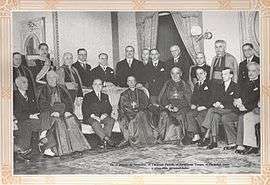 Pius XI with Cardinal Pacelli at the inauguration of Vatican Radio on 12 February 1931. Pacelli took the same papal name as his predecessor, a title used exclusively by Italian Popes. He was quoted as saying, "I call myself Pius; my whole life was under Popes with this name, but especially as a sign of gratitude towards Pius XI." On 15 December 1937, during his last consistory, Pius XI strongly hinted to the cardinals that he expected Pacelli to be his successor, saying "He is in your midst." He had previously been quoted as saying: "When today the Pope dies, you'll get another one tomorrow, because the Church continues. It would be a much bigger tragedy, if Cardinal Pacelli dies, because there is only one. I pray every day, God may send another one into one of our seminaries, but as of today, there is only one in this world." Pius XII slowly eroded the Italian monopoly on the Roman Curia; he employed German and Dutch Jesuit advisors, Robert Leiber, Augustin Bea, and Sebastian Tromp. He also supported the elevation of Americans such as Cardinal Francis Spellman from a minor to a major role in the Church. After World War II, Pius XII appointed more non-Italians than any Pope before him. 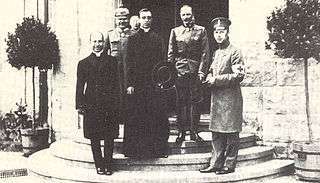 American appointees included Joseph P. Hurley as regent of the nunciature in Belgrade, Gerald P. O'Hara as nuncio to Romania, and Monsignor Muench as nuncio to Germany. For the first time, numerous young Europeans, Asians and "Americans were trained in various congregations and secretariats within the Vatican for eventual service throughout the world." In his second consistory on 12 January 1953, it was expected that his closest co-workers, Msgrs. Domenico Tardini and Giovanni Montini would be elevated and Pius XII informed the assembled cardinals that both of them were originally on the top of his list, but they had turned down the offer, and were rewarded instead with other promotions. The two consistories of 1946 and 1953 brought an end to over five hundred years of Italians constituting a majority of the College of Cardinals. But it is His will, that the worship He instituted and practiced during His life on earth shall continue ever afterwards without intermission. For he has not left mankind an orphan. He still offers us the support of His powerful, unfailing intercession, acting as our "advocate with the Father." He aids us likewise through His Church, where He is present indefectibly as the ages run their course: through the Church which He constituted "the pillar of truth" and dispenser of grace, and which by His sacrifice on the cross, He founded, consecrated and confirmed forever. The Church has, therefore, according to Pius XII, a common aim with Christ himself, teaching all men the truth, and offering to God a pleasing and acceptable sacrifice. This way, the Church re-establishes the unity between the Creator and his creatures. The sacrifice of the altar, being Christ's own actions, convey and dispense divine grace from Christ to the members of the Mystical Body. The numerous reforms of Pius XII show two characteristics. Renewal and rediscovery of old liturgical traditions, such as the reintroduction of the Easter Vigil, and a more structured atmosphere within the Church buildings. Decentralized authority and increased independence of the Uniate Churches were aimed at in the Canon Law/Corpis Iuris Canonici (CIC) reform. In its new constitutions, Eastern Patriarchs were made almost independent from Rome (CIC Orientalis, 1957) Eastern marriage law (CIC Orientalis, 1949), civil law (CIC Orientalis, 1950), laws governing religious associations (CIC Orientalis, 1952) property law (CIC Orientalis, 1952) and other laws. These reforms and writings of Pius XII were intended to establish Eastern Orientals as equal parts of the mystical body of Christ, as explained in the encyclical Mystici corporis. The encyclical Divino afflante Spiritu, published in 1943, emphasized the role of the Bible. Pius XII freed biblical research from previous limitations. He encouraged Christian theologians to revisit original versions of the Bible in Greek and Hebrew. Noting improvements in archaeology, the encyclical reversed Pope Leo XIII's encyclical, which had only advocated going back to the original texts to resolve ambiguity in the Latin Vulgate. The encyclical demands a much better understanding of ancient Jewish history and traditions. It requires bishops throughout the Church to initiate biblical studies for lay people. The Pontiff also requests a reorientation of Catholic teaching and education, relying much more on sacred scriptures in sermons and religious instruction. 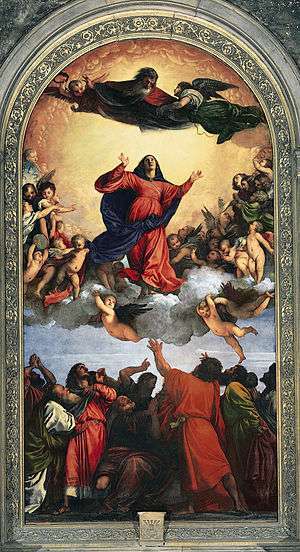 On 1 November 1950, Pius XII defined the dogma of the Assumption (Titian's Assunta (1516–18) pictured). As a young boy and in later life, Pacelli was an ardent follower of the Virgin Mary. He was consecrated as a bishop on 13 May 1917, the very first day of the apparitions of Our Lady of Fátima. He consecrated the world to the Immaculate Heart of Mary in 1942, however, in the second "secret" of Our Lady of Fátima and the letters received from several bishops from Portugal based on the revelations of Lucia Santos in 1929, Our Lady expressly, and specifically asked for the consecration of Russia, not "the world". His remains were to be buried in the crypt of Saint Peter's Basilica on the feast day of Our Lady of Fátima, 13 October 1958. On 1 November 1950, Pius XII defined the dogma of the Assumption of Mary, namely that she "having completed the course of her earthly life, was assumed body and soul into heavenly glory." The dogma was preceded by the 1946 encyclical Deiparae Virginis Mariae, which requested all Catholic bishops to express their opinion on a possible dogmatization. On 8 September 1953, the encyclical Fulgens corona announced a Marian year for 1954, the centennial of the Dogma of the Immaculate Conception. 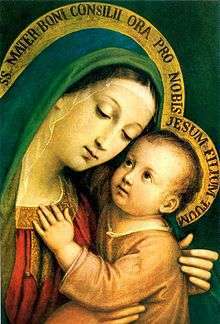 In the encyclical Ad caeli reginam he promulgated the Queenship of Mary feast. Mystici corporis summarizes his mariology. In 1950, Pius XII promulgated Humani generis which acknowledged that evolution might accurately describe the biological origins of human life, but at the same time criticized those who "imprudently and indiscreetly hold that evolution... explains the origin of all things". Catholics must believe that the human soul was created immediately by God. Since the soul is a spiritual substance it is not brought into being through transformation of matter, but directly by God, whence the special uniqueness of each person.." Fifty years later, Pope John Paul II, stating that scientific evidence now seemed to favour the evolutionary theory, upheld the distinction of Pius XII regarding the human soul. "Even if the human body originates from pre-existent living matter, the spiritual soul is spontaneously created by God." Several encyclicals addressed the Eastern Catholic Churches. Orientalis Ecclesiae was issued in 1944 on the 15th centenary of the death of Cyril of Alexandria, a saint common to Eastern Christianity and Latin Churches. Pius XII asks for prayer for better understanding and unification of the Churches. Orientales omnes Ecclesias, issued in 1945 on the 350th anniversary of the reunion, is a call to continued unity of the Ruthenian Church, threatened in its very existence by the authorities of the Soviet Union. Sempiternus Rex was issued in 1951 on the 1500th anniversary of the Ecumenical Council of Chalcedon. It included a call to oriental communities adhering to Miaphysite theology to return to the Catholic Church. Orientales Ecclesias was issued in 1952 and addressed to the Eastern Churches, protesting the continued Stalinist persecution of the Church. Several Apostolic Letters were sent to the bishops in the East. On 13 May 1956, Pope Pius addressed all bishops of the Eastern Rite. Mary, the mother of God, was the subject of encyclical letters to the people of Russia in Fulgens corona, as well as a papal letter to the people of Russia. Pius XII made two substantial interventions on the media. His 1955 discourse The Ideal Movie, originally given in two parts to members of the Italian cinema industry, offered a "sophisticated analysis of the film industry and the role of cinema in modern society." Compared to his predecessor's teaching, the encyclical Miranda Prorsus (1957) shows a "high regard for the importance of cinema, television, and radio." In 1958, Pope Pius XII declared the Feast of the Holy Face of Jesus as Shrove Tuesday (the Tuesday before Ash Wednesday) for all Roman Catholics. The first medal of the Holy Face, produced by Sister Maria Pierina De Micheli, based on the image on the Shroud of Turin had been offered to Pius XII who approved the medal and the devotion based on it. The general devotion to the Holy Face of Jesus had been approved by Pope Leo XIII in 1885 before the image on the Turin Shroud had been photographed. Members of the Canadian Royal 22e Regiment, in audience with Pope Pius XII, following the 1944 Liberation of Rome. 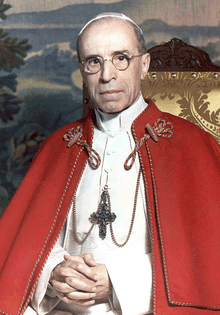 Pius XII lobbied world leaders to prevent the outbreak of World War II and then expressed his dismay that war had come in his October 1939 Summi Pontificatus encyclical. He followed a strict public policy of Vatican neutrality for the duration of the conflict mirroring that of Pope Benedict XV during World War I, but preached against selfish nationalism and, through the use of diplomacy, sermons and radio broadcasts and the creation of the Vatican Information Service, Pius worked to ameliorate the suffering of the victims of the war. He permitted local churches to assess and formulate responses to the Nazis, and instructed them to provide discreet aid to Jews. In Summi Pontificatus, Pius expressed dismay at the killing of non-combatants in the Nazi/Soviet invasion of Poland and expressed hope for the "resurrection" of that country. The Nazis and Soviets commenced a persecution of the Catholic Church in Poland. In April 1940, the Vatican advised the US government that its efforts to provide humanitarian aid had been blocked by the Germans and that the Holy See had been forced to seek indirect channels through which to direct its aid. Michael Phayer, a critic of Pius XII, assesses his policy as having been to "refuse to censure" the "German" invasion and annexation of Poland. This, Phayer wrote, was regarded as a "betrayal" by many Polish Catholics and clergy, who saw his appointment of Hilarius Breitinger as the apostolic administrator for the Wartheland in May 1942, a "implicit recognition" of the breakup of Poland; the opinions of the Volksdeutsche, mostly German Catholic minorities living in occupied Poland, were more mixed. Phayer argues that Pius XII—both before and during his papacy—consistently "deferred to Germany at the expense of Poland", and saw Germany—not Poland—as critical to "rebuilding a large Catholic presence in Central Europe". In May 1942, Kazimierz Papée, Polish ambassador to the Vatican, complained that Pius had failed to condemn the recent wave of atrocities in Poland; when Cardinal Secretary of State Maglione replied that the Vatican could not document individual atrocities, Papée declared, "when something becomes notorious, proof is not required." Although Pius XII received frequent reports about atrocities committed by and/or against Catholics, his knowledge was incomplete; for example, he wept after the war on learning that Cardinal Hlond had banned German liturgical services in Poland. There was a well-known case of Jewish Rabbis who, seeking support against the persecution of Polish Jews by the Third Reich in the General Government (German-occupied Polish zone), complained to the representatives of the Catholic Church. The Church's attempted intervention caused the Third Reich to retaliate by arresting rabbis and deporting them to the death camp. Subsequently, the Catholic Church in Poland abandoned direct intervention, instead focusing on organizing underground aid, with huge international support orchestrated by Pope Pius XII and his Holy See. The Pope was informed about atrocities committed in Poland by the Third Reich by both officials of the Polish Church and the Polish Underground. Those intelligence materials were used by Pius XII on March 11, 1940 during a formal audience with Joachim von Ribbentrop (Hitler's foreign affairs adviser) when Pope was "[[..]] listing the date, place, and precise details of each crime" as described by Joseph L. Lichten  after others. With Poland overrun, but France and the Low Countries yet to be attacked, Pius continued to hope for a negotiated peace to prevent the spread of the conflict. The similarly minded US President Franklin D. Roosevelt re-established American diplomatic relations with the Vatican after a seventy-year hiatus and dispatched Myron C. Taylor as his personal representative. Pius warmly welcomed Roosevelt's envoy and peace initiative, calling it "an exemplary act of fraternal and hearty solidarity... in defence against the chilling breath of aggressive and deadly godless anti-Christian tendencies". American correspondence spoke of "parallel endeavours for peace and the alleviation of suffering". Despite the early collapse of peace hopes, the Taylor mission continued at the Vatican. Pius warned the Allies of the planned German invasion of the Low Countries in 1940. In Rome in 1942, US envoy Myron C. Taylor, thanked the Holy See for the "forthright and heroic expressions of indignation made by Pope Pius XII when Germany invaded the Low countries". After Germany invaded the Low Countries during 1940, Pius XII sent expressions of sympathy to the Queen of the Netherlands, the King of Belgium, and the Grand Duchess of Luxembourg. When Mussolini learned of the warnings and the telegrams of sympathy, he took them as a personal affront and had his ambassador to the Vatican file an official protest, charging that Pius XII had taken sides against Italy's ally Germany. Mussolini's foreign minister claimed that Pius XII was "ready to let himself be deported to a concentration camp, rather than do anything against his conscience." At a special mass at St Peters for the victims of the war, held in November 1940, soon after the commencement of the London Blitz bombing by the Luftwaffe, Pius preached in his homily: "may the whirlwinds, that in the light of day or the dark of night, scatter terror, fire, destruction, and slaughter on helpless folk cease. May justice and charity on one side and on the other be in perfect balance, so that all injustice be repaired, the reign of right restored...." Later he appealed to the Allies to spare Rome from aerial bombing, and visited wounded victims of the Allied bombing of 19 July 1943. Unsuccessfully, Pius attempted to dissuade the Italian Dictator Benito Mussolini from joining Hitler in the war. In April 1941, Pius XII granted a private audience to Ante Pavelić, the leader of the newly proclaimed Croatian state (rather than the diplomatic audience Pavelić had wanted). Pius was criticised for his reception of Pavelić: an unattributed British Foreign Office memo on the subject described Pius as "the greatest moral coward of our age." The Vatican did not officially recognise Pavelić's regime. Pius XII did not publicly condemn the expulsions and forced conversions to Catholicism perpetrated on Serbs by Pavelić; however, the Holy See did expressly repudiate the forced conversions in a memorandum dated 25 January 1942, from the Vatican Secretariat of State to the Yugoslavian Legation. The pope was well-informed of Catholic clergy involvement with the Ustaše regime, even possessing a list of clergymembers who had "joined in the slaughter", but decided against condemning the regime or taking action against the clergy involved, fearing that it would lead to schism in the Croatian church or undermine the formation of a future Croatian state. Pius XII elevated Aloysius Stepinac—a Croatian archbishop convicted of collaborating with the Ustaše—to the cardinalate. Phayer agrees that Stepinac's was a "show trial", but states "the charge that he [Pius XII] supported the Ustaša regime was, of course, true, as everyone knew", and that "if Stepinac had responded to the charges against him, his defense would have inevitably unraveled, exposing the Vatican's support of the genocidal Pavelić." In 1941, Pius XII interpreted Divini Redemptoris, an encyclical of Pope Pius XI, which forbade Catholics to help communists, as not applying to military assistance to the Soviet Union. This interpretation assuaged American Roman Catholics who had previously opposed Lend-Lease arrangements with the Soviet Union. The Pope employed the new technology of radio and a series of Christmas messages to preach against selfish nationalism and the evils of modern warfare and offer sympathy to the victims of the war. Pius XII's 1942 Christmas address via Vatican Radio voiced concern at human rights abuses and the murder of innocents based on race. The majority of the speech spoke generally about human rights and civil society; at the very end of the speech, Pius XII mentioned "the hundreds of thousands of persons who, without any fault on their part, sometimes only because of their nationality or race, have been consigned to death or to a slow decline". According to Rittner, the speech remains a "lightning rod" in debates about Pius XII. 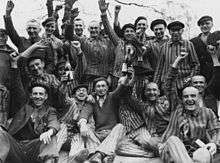 The Nazis themselves responded to the speech by stating that it was "one long attack on everything we stand for....He is clearly speaking on behalf of the Jews....He is virtually accusing the German people of injustice toward the Jews, and makes himself the mouthpiece of the Jewish war criminals." The New York Times wrote that "The voice of Pius XII is a lonely voice in the silence and darkness enveloping Europe this Christmas....In calling for a 'real new order' based on 'liberty, justice and love,'...the pope put himself squarely against Hitlerism." Historian Michael Phayer claims, however, that "it is still not clear whose genocide or which genocide he was referring to". Speaking on the 50th anniversary of Pius's death in 2008, the German Pope Benedict XVI recalled that the Pope's voice had been "broken by emotion" as he "deplored the situation" with a "clear reference to the deportation and extermination of the Jews." Cesare Orsenigo, Pius XII's nuncio to Germany throughout World War II, with Hitler and Joachim von Ribbentrop. In his 1939 Summi Pontificatus first papal encyclical, Pius reiterated Catholic teaching against racial persecution and antisemitism and affirmed the ethical principles of the "Revelation on Sinai". At Christmas 1942, once evidence of mass executions of Jews had emerged, Pius XII voiced concern at the murder of "hundreds of thousands" of "faultless" people because of their "nationality or race" and intervened to attempt to block Nazi deportations of Jews in various countries. Upon his death in 1958, Pius was praised emphatically by the Israeli Foreign Minister, and other world leaders. But his insistence on Vatican neutrality and avoidance of naming the Nazis as the evildoers of the conflict became the foundation for contemporary and later criticisms from some quarters. His strongest public condemnation of genocide was considered inadequate by the Allied Powers, while the Nazis viewed him as an Allied sympathizer who had dishonored his policy of Vatican neutrality. Hitler biographer John Toland, while scathing of Pius's cautious public comments in relation to the mistreatment of Jews, concluded that the Allies' own record of action against the Holocaust was "shameful", while "The Church, under the Pope's guidance, had already saved the lives of more Jews than all other churches, religious institutions and rescue organizations combined...". In April 1939, after the submission of Charles Maurras and the intervention of the Carmel of Lisieux, Pius XII ended his predecessor's ban on Action Française, an organisation described by some authors as virulently antisemitic and anti-Communist. In 1941, Cardinal Theodor Innitzer of Vienna informed Pius of Jewish deportations in Vienna. Later that year, when asked by French Marshal Philippe Pétain if the Vatican objected to antisemitic laws, Pius responded that the church condemned antisemitism, but would not comment on specific rules. 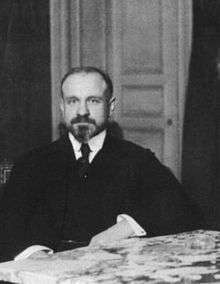 Similarly, when Philippe Pétain's regime adopted the "Jewish statutes", the Vichy ambassador to the Vatican, Léon Bérard (a French politician), was told that the legislation did not conflict with Catholic teachings. 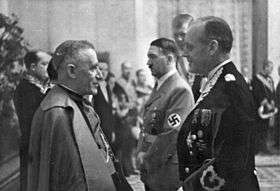 Valerio Valeri, the nuncio to France was "embarrassed" when he learned of this publicly from Pétain and personally checked the information with Cardinal Secretary of State Maglione who confirmed the Vatican's position. In June 1942, Pius XII personally protested against the mass deportations of Jews from France, ordering the papal nuncio to protest to Pétain against "the inhuman arrests and deportations of Jews". In September 1941, Pius XII objected to a Slovak Jewish Code, which, unlike the earlier Vichy codes, prohibited intermarriage between Jews and non-Jews. In October 1941, Harold Tittmann, a US delegate to the Vatican, asked the pope to condemn the atrocities against Jews; Pius replied that the Vatican wished to remain "neutral," reiterating the neutrality policy which Pius invoked as early as September 1940. On 18 September 1942, Pius XII received a letter from Monsignor Montini (future Pope Paul VI), saying, "the massacres of the Jews reach frightening proportions and forms." Later that month, Myron Taylor, U.S. representative to the Vatican, warned Pius that the Vatican's "moral prestige" was being injured by silence on European atrocities, a warning which was echoed simultaneously by representatives from the United Kingdom, Brazil, Uruguay, Belgium, and Poland. Myron C. Taylor passed a US Government memorandum to Pius on 26 September 1942, outlining intelligence received from the Jewish Agency for Palestine which said that Jews from across the Nazi Empire were being systematically "butchered". Taylor asked if the Vatican might have any information which might "tend to confirm the reports", and if so, what the Pope might be able to do to influence public opinion against the "barbarities". Cardinal Maglione handed Harold Tittmann a response to the letter on 10 October. The note thanked Washington for passing on the intelligence, and confirmed that reports of severe measures against the Jews had reached the Vatican from other sources, though it had not been possible to "verify their accuracy". Nevertheless, "every opportunity is being taken by the Holy See, however, to mitigate the suffering of these unfortunate people". In December 1942, when Tittmann asked Cardinal Secretary of State Maglione if Pius would issue a proclamation similar to the Allied declaration "German Policy of Extermination of the Jewish Race", Maglione replied that the Vatican was "unable to denounce publicly particular atrocities." Pius XII directly explained to Tittman that he could not name the Nazis without at the same time mentioning the Bolsheviks. Following the Nazi/Soviet invasion of Poland, Pius XII's Summi Pontificatus called for the sympathy of the whole world towards Poland, where "the blood of countless human beings, even noncombatants" was being spilled. Pius never publicly condemned the Nazi massacre of 1,800,000–1,900,000 Poles, overwhelmingly Roman Catholic (including 2,935 members of the Catholic clergy), In late 1942, Pius XII advised German and Hungarian bishops to speak out against the massacres on the Eastern Front. In his 1942 Christmas Eve message, he expressed concern for "those hundreds of thousands, who ... sometimes only by reason of their nationality or race, are marked down for death or progressive extinction. On 7 April 1943, Msgr. Tardini, one of Pius XII's closest advisors, advised Pius XII that it would be politically advantageous after the war to take steps to help Slovak Jews. On 26 September 1943, following the German occupation of northern Italy, Nazi officials gave Jewish leaders in Rome 36 hours to produce 50 kilograms (110 lb) of gold (or the equivalent) threatening to take 300 hostages. Then Chief Rabbi of Rome Israel Zolli recounts in his memoir that he was selected to go to the Vatican and seek help. The Vatican offered to loan 15 kilos, but the offer proved unnecessary when the Jews received an extension. Soon afterward, when deportations from Italy were imminent, 477 Jews were hidden in the Vatican itself and another 4,238 were protected in Roman monasteries and convents. Eighty percent of Roman Jews were saved from deportation. Phayer argues that the German diplomats in Rome were the "initiators of the effort to save the city's Jews", but holds that Pius XII "cooperated in this attempt at rescue", while agreeing with Zuccotti that the pope "did not give orders" for any Roman Catholic institution to hide Jews. On 30 April 1943, Pius XII wrote to Bishop Graf von Preysing of Berlin to say: "We give to the pastors who are working on the local level the duty of determining if and to what degree the danger of reprisals and of various forms of oppression occasioned by episcopal declarations... ad maiora mala vitanda (to avoid worse)... seem to advise caution. Here lies one of the reasons, why We impose self-restraint on Ourselves in our speeches; the experience, that we made in 1942 with papal addresses, which We authorized to be forwarded to the Believers, justifies our opinion, as far as We see.... The Holy See has done whatever was in its power, with charitable, financial and moral assistance. To say nothing of the substantial sums which we spent in American money for the fares of immigrants." On 28 October 1943, Ernst von Weizsäcker, the German Ambassador to the Vatican, telegraphed Berlin that "...the Pope has not yet let himself be persuaded to make an official condemnation of the deportation of the Roman Jews.... Since it is currently thought that the Germans will take no further steps against the Jews in Rome, the question of our relations with the Vatican may be considered closed." After World War II Pope Pius XII focused on material aid to war-torn Europe, an internal internationalization of the Roman Catholic Church, and the development of its worldwide diplomatic relations. His encyclicals, Evangelii praecones and Fidei donum, issued on 2 June 1951 and 21 April 1957, respectively, increased the local decision-making of Catholic missions, many of which became independent dioceses. Pius XII demanded recognition of local cultures as fully equal to European culture. Though his language retained old conceptions – Africa, for example, merited special attention since the church there worked 'to forward her work among the heathen multitudes' - in 1956 he expressed solidarity with the 'non-Europeans who aspire to full political independence.' Continuing the line of his predecessors, Pius XII supported the establishment of local administration in Church affairs: in 1950, the hierarchy of Western Africa became independent; in 1951, Southern Africa; and in 1953, British East Africa. Finland, Burma and French Africa became independent dioceses in 1955. In the immediate aftermath of the war, Pius XII elevated a number of high-profile resistors of Nazism to the College of Cardinals in 1946, among them the German Bishops Joseph Frings of Cologne, August von Galen of Münster and Konrad von Preysing of Berlin. From elsewhere in the liberated Nazi Empire Pius selected other resistors: Dutch Archbishop Johannes de Jong; Hungarian Bishop József Mindszenty; Polish Archbishop Adam Stefan Sapieha; and French Archbishop Jules-Géraud Saliège. In 1946 and 1953, respectively, he named as cardinals Thomas Tien of China and Valerian Gracias of India – the first indigenous Catholics of their respective nations to sit in the College of Cardinals. Italian Papal diplomat Angelo Roncalli (later Pope John XXIII) and Polish Archbishop Stefan Wyszyński were others among those elevated in 1953. Pius XII was rather distrustful of Alcide de Gasperi and Italy's Christian Democrats, considering the party indecisive and fractious – reformist currents within it particularly, which tended to the moderate Left – represented by the Sicilian priest Luigi Sturzo for example – he considered too accommodating to the Left. On the eve of the 1952 local elections in Rome, in which again the Communist and Socialist parties threatened to win out, he used informal connections to make his views known. Pius XII stated that the war against communism was a holy war and excommunicated members of the Communist Party. Having decided to encourage the Christian Democrats to consider a political alliance with the Rightist parties as part of an anti-left coalition, he asked the Jesuit, Father Riccardo Lombardi, to speak with de Gasperi to consider such an alliance – an electoral alliance with those even of monarchist and neo-fascist tendencies -including the Italian Social Movement. Adopting a domino theory he warned that, "If the Communists win in Rome, in Italy, it will cast a shadow on the entire world: France would become Communist, and then Spain and then all of Europe'. de Gasperi rejected the idea as politically dangerous to the long term fortunes of a centrist Catholic party. The last years of the pontificate of Pius XII began in late 1954 with a long illness, during which he considered abdication. Afterwards, changes in his work habit became noticeable. The Pope avoided long ceremonies, canonizations and consistories and displayed hesitancy in personnel matters. He found it increasingly difficult to chastise subordinates and appointees such as his physician, Riccardo Galeazzi-Lisi, who, after numerous indiscretions was excluded from Papal service for the last years, but, keeping his title, was able to enter the papal apartments to make photos of the dying Pope, which he sold to French magazines. Pius underwent three courses of cellular rejuvenation treatment administered by Paul Niehans, the most important in 1954 when Pacelli was gravely ill. Side-effects of the treatment included hallucinations, from which the Pope suffered in his last years. "These years were also plagued by horrific nightmares. Pacelli's blood-curdling screams could be heard throughout the papal apartments." Following his 1954 illness, Pope Pius XII still addressed lay people and groups about a wide range of topics. Sometimes he answered specific moral questions, which were addressed to him. To professional associations he explained specific occupational ethics in light of Church teachings. Robert Leiber helped him occasionally with his speeches and publications. Cardinal Augustine Bea SJ was his personal confessor. 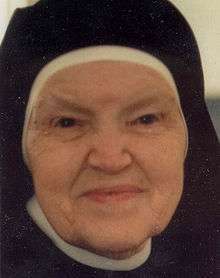 Sister Pasqualina was for forty years his "housekeeper, muse and lifelong companion". Pius XII died on 9 October 1958 of acute heart failure brought on by a sudden myocardial infarction in Castel Gandolfo, the papal summer residence. His doctor Gaspanini said afterwards: "The Holy Father did not die because of any specific illness. He was completely exhausted. He was overworked beyond limit. His heart was healthy, his lungs were good. He could have lived another 20 years, had he spared himself." Pope Pius XII did not want the vital organs removed from his body, demanding instead that it be kept in the same condition "in which God created it". According to Galeazzi-Lisi, this was the reason why he and Nuzzi, an embalmer from Naples, used a novel embalming approach invented by Nuzzi. In a controversial press conference, Galeazzi-Lisi described in great detail the embalming of the body of the late pontiff. He claimed to have used the same system of oils and resins with which the body of Jesus Christ was preserved. Galeazzi-Lisi asserted that the new process would "preserve the body indefinitely in its natural state" However, whatever chance the new embalming process had of efficaciously preserving the body was obliterated by intense heat in Castel Gandolfo during the embalming process. As a result, the body decomposed rapidly and the viewing of the faithful had to be terminated abruptly. Galeazzi-Lisi reported that heat in the halls, where the body of the late Pope lay in state, caused chemical reactions which required it to be treated twice after the original preparation. Swiss Guards stationed around Pius XII's body were reported to have become ill during their vigil. On 21 September 1945, the general secretary of the World Jewish Council, Leon Kubowitzky, presented an amount of money to the pope, "in recognition of the work of the Holy See in rescuing Jews from Fascist and Nazi persecutions." After the war, in the autumn of 1945, Harry Greenstein from Baltimore, a close friend of Chief Rabbi Herzog of Jerusalem, told Pius XII how grateful Jews were for all he had done for them. "My only regret", the pope replied, "is not to have been able to save a greater number of Jews." 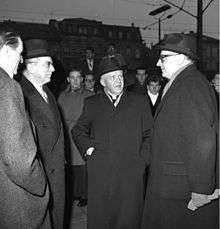 Pinchas Lapide, a Jewish theologian and Israeli diplomat to Milan in the 1960s, estimated controversially in Three Popes and the Jews that Pius "was instrumental in saving at least 700,000 but probably as many as 860,000 Jews from certain death at Nazi hands." Some historians have questioned this often cited number, which Lapide reached by "deducting all reasonable claims of rescue" by non-Catholics from the total number of European Jews surviving the Holocaust. A Roman Catholic scholar, Kevin Madigan, has interpreted this and other praise from prominent Jewish leaders, including Golda Meir, as less than sincere, an attempt to secure Vatican recognition of the State of Israel. In 1963, Rolf Hochhuth's controversial drama Der Stellvertreter. Ein christliches Trauerspiel (The Deputy, a Christian tragedy, released in English in 1964) portrayed Pope Pius XII as a hypocrite who remained silent about the Holocaust. The depiction is described as lacking "credible substantiation" by the Encyclopædia Britannica. Books such as Joseph Lichten's A Question of Judgment (1963), written in response to The Deputy, defended Pius XII's actions during the war. Lichten labelled any criticism of the pope's actions during World War II as "a stupefying paradox" and said, "no one who reads the record of Pius XII's actions on behalf of Jews can subscribe to Hochhuth's accusation." Critical scholarly works like Guenter Lewy's controversial The Catholic Church and Nazi Germany (1964) also followed the publication of The Deputy. Lewy's conclusion was that "the Pope and his advisers—influenced by the long tradition of moderate anti-Semitism so widely accepted in Vatican circles—did not view the plight of the Jews with a real sense of urgency and moral outrage. For this assertion no documentation is possible, but it is a conclusion difficult to avoid". In 2002 the play was adapted into the film, Amen.. An article on La Civilità Cattolica in March 2009 indicated that the accusations that Hochhuth's play made widely known originated not among Jews but in the Communist bloc. It was on Moscow Radio, on 2 June 1945, that the first accusation directly against Pius XII of refusing to speak out against the exterminations in Nazi concentration camps. It was also the first medium to call him "Hitler's Pope". In 1999, British author John Cornwell's Hitler's Pope criticised Pius XII for his actions and inactions during the Holocaust. Cornwell argued that Pius XII subordinated opposition to the Nazis to his goal of increasing and centralising the power of the Papacy. Further, Cornwell accused Pius XII of anti-Semitism. The Encyclopædia Britannica described Cornwell's depiction of Pius XII as anti-Semitic as lacking "credible substantiation". Kenneth L. Woodward stated in his review in Newsweek that "errors of fact and ignorance of context appear on almost every page." Paul O'Shea summarized the work by saying it was "disappointing because of its many inaccuracies, selective use of sources, and claims that do not bear any scrutiny. However, [Cornwell] has rendered a service by insisting Pacelli be re-examined thoroughly and placed firmly within the context of his times". Five years after the publication of Hitler's Pope, Cornwell stated: "I would now argue, in the light of the debates and evidence following Hitler's Pope, that Pius XII had so little scope of action that it is impossible to judge the motives for his silence during the war, while Rome was under the heel of Mussolini and later occupied by Germany". In specific riposte to Cornwell's criticism, American Rabbi and historian, David Dalin, published The Myth of Hitler's Pope: How Pope Pius XII Rescued Jews from the Nazis in 2005. He reaffirmed previous accounts of Pius having been a saviour of thousands of Europe's Jews. In a review of the book, another Jewish scholar—Churchill biographer, Martin Gilbert—wrote that Dalin's work was "an essential contribution to our understanding of the reality of Pope Pius XII's support for Jews at their time of greatest danger. Hopefully, his account will replace the divisively harmful version of papal neglect, and even collaboration, that has held the field for far too long". Dalin's book also argued that Cornwell and others were liberal Catholics and ex-Catholics who "exploit the tragedy of the Jewish people during the Holocaust to foster their own political agenda of forcing changes on the Catholic Church today" and that Pius XII was responsible for saving the lives of many thousands of Jews. In his 2003 book, A Moral Reckoning, Daniel Goldhagen, asserted that Pius XII "chose again and again not to mention the Jews publicly.... [In] public statements by Pius XII ... any mention of the Jews is conspicuously absent." In a review of Goldhagen's book, Mark Riebling counters that Pius used the word "Jew" in his first encyclical, Summi Pontificatus, published on 20 October 1939. "There Pius insisted that all human beings be treated charitably—for, as Paul had written to the Colossians, in God's eyes "there is neither Gentile nor Jew." In saying this, the Pope affirmed that Jews were full members of the human community—which is Goldhagen's own criterion for establishing 'dissent from the anti-Semitic creed.'" In Pius XII, The Hound of Hitler, Catholic journalist Gerard Noel, dismissed accusations that Pius was "anti-semitic" or "pro-Nazi", but accused him of "silence" based on fear of retaliation and wrote that " Hitler played the Pope with consummate expertise". Gerald Steinacher's Nazis on the Run accused Pius of turning a blind eye to the activities of Vatican priests assisting "denazification through conversion" - which, he said, helped ex-Nazi anticommunists to escape justice. A Berlin Jewish couple, Mr. and Mrs. Wolfsson, argued in defense of the pope: "None of us wanted the Pope to take an open stand. We were all fugitives, and fugitives do not wish to be pointed at. The Gestapo would have become more excited and would have intensified its inquisitions. If the Pope had protested, Rome would have become the center of attention. It was better that the Pope said nothing. We all shared this opinion at the time, and this is still our conviction today." There were examples when Church reaction to Nazi brutality only intensified SS persecutions of both: Jews and the Church. Two important and recent studies are worth mentioning here. In The Real Odessa. How Peron Brought the Nazi War Criminals to Argentina (2002), the Argentine journalist, Uki Goñi described how the Argentinean government dealt with war criminals that entered Argentina. However, during his research Goñi accidentally stumbled on documents of the British Foreign Office about the involvement of Vatican personnel in the smuggling of war criminals, the so-called post-war "ratlines". Goñi found out that the British Envoy D'Arcy Osborne had intervened with Pope Pius XII to put an end to these illegal activities. Furthermore, he discovered "that the Pope secretly pleaded with Washington and London on behalf of notorious criminals and Nazi collaborators". Suzanne Brown-Fleming's The Holocaust and Catholic Conscience. Cardinal Aloisius Muench and the Guilt Question in Germany (2006) underlines Goñi's findings. In her remarkable study, Brown-Fleming clearly demonstrated how Pius XII intervened on behalf of rather vicious German war criminals (e.g. Otto Ohlendorf). Brown-Fleming's main source was the archive of Pope Pius XII's representative in post-war Germany, Cardinal Aloisius Muench. Then, Phayer's Pius XII, The Holocaust, and the Cold War (2008) makes use of many documents that have recently come to light thanks to Bill Clinton's 1997 executive order declassifying wartime and postwar documents, many of which are currently at the US National Archives and Holocaust Memorial Museum. These documents include diplomatic correspondence, American espionage, and even decryptions of German communications. Relevant documents have also been released by the Argentine government and the British Foreign Office and other information sources have become available, including the diary of Bishop Hurley. These documents reveal new information about Pius XII's actions regarding the Ustaše regime, the genocides in Poland, the finances of the wartime church, the deportation of the Roman Jews, and the ratlines for Nazis and fascists fleeing Europe. According to Phayer, "the face of Pope Pius that we see in these documents is not the same face we see in the eleven volumes the Vatican published of World War II documents, a collection which, though valuable, is nonetheless critically flawed because of its many omissions". ↑ Joseph Bottum; David G. Dalin (2004). The Pius War: Responses to the Critics of Pius XII. Lexington Books. pp. 224–27. ↑ Pius XII (11 December 1925). "Pius XII: ''Summi Pontificatus'', 1939". Vatican.va. Retrieved 23 June 2013. 1 2 "Encyclopædia Britannica : ''Reflections on the Holocaust''". Britannica.com. Retrieved 23 June 2013. 1 2 Pitel, Laura (19 December 2009). "Pope John Paul II and Pope Pius XII move closer to sainthood". London: The Times. Retrieved 25 September 2011. ↑ John Cornwell (2000). Hitler's Pope: The Secret History of Pius XII. Penguin. p. 78. ↑ Joseph Bottum. April 2004. "The End of the Pius Wars" Archived 10 June 2011 at the Wayback Machine., First Things; retrieved 1 July 2009. ↑ Bussmann, Walter (1969). "Pius XII an die deutschen Bischöfe". Hochland. 61: 61–65. 1 2 Hill, Roland. 1997, 11 August. "The lost encyclical", The Tablet. ↑ "Nostra aetate: Transforming the Catholic-Jewish Relationship: Jewish-Catholic Relationship Transformed". Adl.org. Retrieved 6 May 2009. ↑ Bokenkotter, pp. 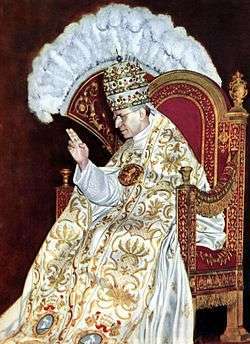 389–92, quote "And when Hitler showed increasing belligerance toward the Church, Pius met the challenge with a decisiveness that astonished the world. His encyclical Mit brennender Sorge was the "first great official public document to dare to confront and criticize Nazism" and "one of the greatest such condemnations ever issued by the Vatican". Smuggled into Germany, it was read from all the Catholic pulpits on Palm Sunday in March 1937. It exposed the fallacy and denounced the Nazi myth of blood and soil; it decried its neopaganism, its war of annihilation against the Church, and even described the Führer himself as a "mad prophet possessed of repulsive arrogance". The Nazis were infuriated, and in retaliation closed and sealed all the presses that had printed it and took numerous vindictive measures against the Church, including staging a long series of immorality trials of the Catholic clergy." ↑ Catholic Forum. Pope Pius XII profile Archived 24 April 2006 at the Wayback Machine..
↑ In the Secretariat of State he had actively supported "foreigners", for example Francis Spellman, the American monsignor, whom he consecrated himself as the first American Bishop in the Vatican curia. 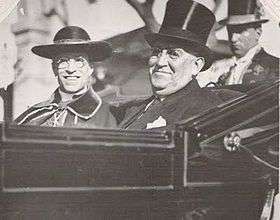 Spellman had organized and accompanied Pacelli's American journey and arranged a meeting with President Roosevelt. Only 30 days after his coronation, on 12 April 1939, Pope Pius XII named Spellman as archbishop of New York. ↑ Tobin, Greg. (2003). Selecting the Pope: Uncovering the Mysteries of Papal Elections. Barnes & Noble Publishing; ISBN 0-7607-4032-1. pp. xv–xvi, 143. ↑ "Fátima - 1984 Consecration". ↑ "Finding God in human evolution". Retrieved 17 December 2011. ↑ "Univ of Dayton". Campus.udayton.edu. 30 July 2009. Retrieved 12 September 2010. ↑ Orientales omnes Ecclesias, AAS, 1946, pp. 33–63. ↑ Sempiternus Rex, AAS, 1951, pp. 625–44. ↑ Orientales Ecclesias. AAS, 1953, pp. 5–15. ↑ Apostolic Letters to the bishops in the East. AAS, 1956, pp. 260–64. 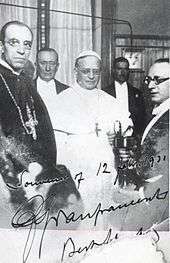 ↑ Papal letter to the People of Russia, AAS, 1952, pp. 505–11. ↑ Helmuth Rolfes, "Inter Mirifica and What Followed: The Second Vatican Council as the Beginning of a New Era in the Relationship Between the Church and the Media," in Helmuth Rolfes and Angela Ann Zukowski, eds., Communicatio Socialis, Challenge of Theology and Ministry in the Church, Festschrift for Franz-Josef Eilers (Kassel, Germany: Kassel University Press, 2007), 11. 1 2 3 "Encyclopædia Britannica's Reflections on the Holocaust". Britannica.com. Retrieved 23 June 2013. ↑ McGoldrick, Patricia M. (2012). "New Perspectives on Pius XII and Vatican Financial Transactions during the Second World War". Historical Journal. 55 (4): 1029–48. doi:10.1017/S0018246X12000416. 1 2 Pius XII (11 December 1925). "''SUMMI PONTIFICATUS'' - Section 106". Vatican.va. Retrieved 23 June 2013. ↑ Pius XII, Summi Pontificatus; 48; October 1939. 1 2 Pius XII (11 December 1925). "Pius XII, ''Summi Pontificatus''; 35; October 1939". Vatican.va. Retrieved 23 June 2013. 1 2 Pius XII (11 December 1925). "Pius XII, ''Summi Pontificatus''; 109; October 1939". Vatican.va. Retrieved 23 June 2013. ↑ Pius XII, Summi Pontificatus; 111; October 1939. 1 2 3 Pius XII (11 December 1925). "Pius XII, ''Summi Pontificatus''; 106; October 1939". Vatican.va. Retrieved 23 June 2013. 1 2 Pius XII (11 December 1925). "''SUMMI PONTIFICATUS'' - Section 6 & 7". Vatican.va. Retrieved 23 June 2013. ↑ 108: "In the midst of this world which today presents such a sharp contrast to "The Peace of Christ in the Reign of Christ," the Church and her faithful are in times and in years of trial such as have rarely been known in her history of struggle and suffering". ↑ Pius XII (11 December 1925). "''SUMMI PONTIFICATUS'' - Section 28". Vatican.va. Retrieved 23 June 2013. ↑ Report by the Polish Ambassador to the Holy See on the Situation in German-occupied Poland, Memorandum No. 79, 29 May 1942, Myron Taylor's papers, NARA. ↑ "The Vatican & the Holocaust: A Question of Judgment - Pius XII & the Jews by Dr. Joseph L. Lichten". www.jewishvirtuallibrary.org. 1 2 "Franklin D. Roosevelt Presidential Library and Museum - ''The Vatican Files''". Docs.fdrlibrary.marist.edu. Retrieved 23 June 2013. ↑ "Franklin D. Roosevelt Presidential Library and Museum - ''Letter from Pius XII to FDR, 7 January 1940''". Docs.fdrlibrary.marist.edu. 27 May 2004. Retrieved 23 June 2013. ↑ "Franklin D. Roosevelt Presidential Library and Museum - ''Statement by Myron C. Taylor to Pope Pius XII, 19 September 1942''". Retrieved 23 June 2013. ↑ Hume, Brit (18 August 2006). "The American Spectator : Hitler's Pope?". Spectator.org. Retrieved 23 June 2013. ↑ "Harold Taylor 9/30/42". Docs.fdrlibrary.marist.edu. 27 May 2004. Retrieved 23 June 2013. ↑ Rychlak, Ronald. Hitler, the War, and the Pope pp. 414–15, note 61. ↑ "Religion: Rising Sun at the Vatican". Time Magazine. 6 April 1942. Retrieved 17 December 2011. ↑ "Envoy to Vatican named; Tokyo Reports Choice of Harada Under De Facto Relations". The New York Times. 27 March 1942. Retrieved 17 December 2011. ↑ "Chen Fang-Chung, ''Lou Tseng-Tsiang: A Lover of His Church and of His Country". Hsstudyc.org.hk. Retrieved 17 December 2011. ↑ Chadwick, 1988, pp. 256–57. ↑ Alvarez and Graham, 1997, pp. 86–88. ↑ Kent, 2002, pp. 87–100. ↑ "News Release, 28 August 1944". Trumanlibrary.org. 29 August 1944. Retrieved 12 September 2010. ↑ Encyclopædia Britannica: "Roman Catholicism – the period of the world wars." ↑ Lesser, Jeffrey. 1995. Welcoming the Undesirables: Brazil and the Jewish Question. University of California Press. pp. 151–68. ↑ Pius XII (11 December 1925). "Pius XII, ''Summi Pontificatus''; 7 & 48; October 1939". Vatican.va. Retrieved 23 June 2013. ↑ Pius XII (11 December 1925). "Pius XII, ''Summi Pontificatus''; 111; October 1939". Vatican.va. Retrieved 23 June 2013. ↑ Ewers, Justin (17–24 November 2008). Sainthood on Hold. U.S. News and World Report. ↑ Phayer, 2000, pp. 27–28. ↑ Hilberg, Raul, The Destruction of the European Jews, (2003) 3rd edition, pp. 1204–05. ↑ (French) Actes et documents du Saint Siège relatifs à la Seconde Guerre mondiale/éd. par Pierre Blet, Angelo Martini, Burkhart Schneider and Robert Graham (7 April 1943). ↑ "The role of the Roman Catholic Church in the Shoah (Nazi Holocaust)". Religioustolerance.org. Retrieved 6 May 2009. ↑ Letter of Pius XII of 30 April 1943 to the Bischop of Berlin, Graf von Preysing, published in "Documentation catholique" of 2 February 1964. ↑ Lang, Berel (Fall 2001). "Not Enough vs. Plenty': Which did Pius XII do?". Judaism. 50 (4): 448. ↑ "860,000 Lives Saved—The Truth About Pius XII and the Jews". "Jewish Virtual Library. Retrieved 18 February 2012. ↑ Anti-Defamation League. ADL to Vatican: "Open Baptismal Records and Put Pius Beatification on Hold". 13 January 2005. ↑ Cavalli, Dimitri. "Pius's Children". The American. 1 April 2006. 1 2 3 Quigley, Christine (1998). Modern Mummies. McFarland & Co. ISBN 978-0-7864-0492-6. ↑ "CNS STORY: Sainthood congregation recommends Pope Pius XII be named venerable". Catholicnews.com. Retrieved 6 May 2009. ↑ AFP. 22 December 2009. "Wiesenthal Center shocked at pope Pius sainthood moves Archived 22 November 2011 at the Wayback Machine.". ↑ Jacqueline Maley. 24 December 2009. "Rabbi hits out at Pope's Veneration of Pius XII". Sydney Morning Herald. ↑ Gagliarducci, Andrea. "St. Pius XII? Pope Francis Mulling It Over, Says Vatican Source". Retrieved 2 August 2013. ↑ Ben-zvi, Gidon. "Pope May Open Holocaust Era Vatican Archives, Possibly Shedding Light On Pope Pius XII's Role". Retrieved 22 January 2014. 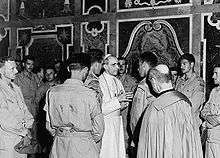 ↑ "Report: Pope Francis to examine Pius' wartime record before deciding on sainthood". Retrieved 22 January 2014. ↑ "Report: Pope Secret Vatican archives on Pius not ready to be opened". Retrieved 22 January 2014. ↑ "Pope Francis: 'Pius XII's Cause for beatification has stalled'". 27 May 2014. Retrieved 28 May 2014. ↑ "Dalla Teche Rai un Pio XII inatteso". Papa Pio XII. 8 January 2016. Retrieved 10 January 2016. ↑ "Pio XII come Papa Francesco amava incontrare la gente". Papa Pio XII. 13 January 2016. Retrieved 14 January 2016. ↑ "Amazing Miracle Story for Pope Pius XII Canonization?". Roman Catholic Man. 5 May 2015. Retrieved 6 January 2016. ↑ "Questa malattia non è per la morte". Papa Pio XII. Retrieved 6 January 2016. ↑ Time. 16 August 1943. ↑ "New York Times 25 December 1941 and 25 December 1942". Catholicleague.org. Archived from the original on 31 July 2010. Retrieved 12 September 2010. ↑ McInerney, Ralph, The Defamation of Pius XII, 2001. ↑ Poliakov, Leon; November (1950). "The Vatican and the 'Jewish Question': The Record of the Hitler Period—and After". Commentary. 10: 439–49. 1 2 3 4 "The Good Samaritan. Jewish Praise for Pope Pius XII by Dimitri Cavalli". Ewtn.com. Retrieved 12 September 2010. ↑ Rabbi David Dalin (26 February 2001). "A Righteous Gentile: Pope Pius XII and the Jews". Catholic League for Religious and Civil Rights. Retrieved 12 September 2010. ↑ Lichten, 1963, A Question of Judgement Archived 25 July 2006 at the Wayback Machine..
↑ Marchione, 2000, pp. 16–17. ↑ Phayer, 2000, pp. xii–xiii. ↑ Kenneth L. Woodward. The Case Against Pius Xii, Newsweek. 27 September 1999. ↑ The Economist, 9 December 2004. ↑ "For God's sake". The Economist. 9 December 2004. 1 2 "Encyclopædia Britannica's Reflections on the Holocaust". Britannica.com. Retrieved 23 June 2013. ↑ Rychlak, Ronald J. Hitler, the War and the Pope Genesis Press, Columbus, MS: 2000, pp. 401 ff. ↑ Sparks fly at Pius XII debate in London; Catholic Herald; 23 November 2012. ↑ "Mark Riebling, "Jesus, Jews, and the Shoah", ''National Review'', 27 January 2003" (PDF). Retrieved 17 December 2011. ↑ Lichten, Joseph L. "The Vatican & the Holocaust: A Question of Judgment - Pius XII & the Jews". Jewish Virtual Library. ↑ International Catholic-Jewish Historical Commission (2000). "The Vatican and the Holocaust: A Preliminary Report". Jewish Virtual Library. ↑ Melissa Radler. "Vatican Blocks Panel's Access to Holocaust Archives." The Jerusalem Post. 24 July 2001. ↑ Katz, Robert (2003). The Battle for Rome: The Germans, the Allies, the Partisans, and the Pope, September 1943–June 1944. New York, NY: Simon & Schuster. p. 249ff. ↑ Goñi, afterword to the revised 2003 edition, pp. 327–348. ↑ Brown-Fleming, 2006, Chapter 4: Granting Absolution. Muench and the Catholic Clemency Campaign. ↑ "Address at the conclusion of the symposium organized by the "Pave the Way Foundation"". Vatican.va. 19 September 2008. Retrieved 6 May 2009. ↑ "Vatican recalls life and teachings of Pius XII 50 years after his death". Catholicnewsagency.com. Retrieved 6 May 2009. ↑ Donadio, Rachel (9 October 2008). "Synod Controversy". Italy: Nytimes.com. Retrieved 17 December 2011. ↑ Jerusalem Post. 2009, 17 June "Foundation says documents will show Pius helped Jews". Mark Riebling.2015. ''Church of Spies: The Pope's Secret War Against Hitler''. Basic Books. ISBN 978-0-465-02229-8. ISBN 0465022294. (Italian) Angelini, Fiorenzo. 1959. Pio XII, Discorsi Ai Medici. Rome. (German) Utz, A. F., and Gröner, J. F. (eds.). Soziale Summe Pius XII 3 vol. Kertzer, David I. The Pope and Mussolini: The secret history of Pius XI and the rise of Fascism in Europe. Oxford University Press, 2014. Kertzer, David. "The Life & Pontificate of Pope Pius XII. Between History and Controversy." Journal of Modern Italian Studies 18, no. 4 (2013): 526-528. Wikimedia Commons has media related to Pope Pius XII. The Vatican & the Holocaust: 860,000 Lives Saved - The Truth About Pius XII & the Jews by Robert A. Graham, S.J.